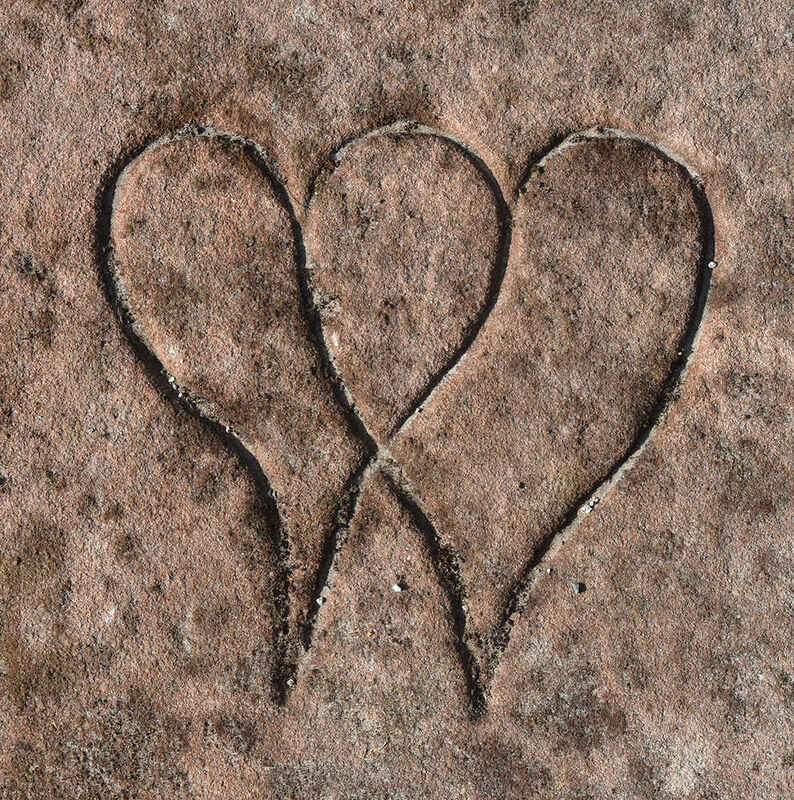 Visitors to Kirkmichael entering the nave often pause by the tablestone at the doorway, intrigued by the large entwined hearts, and wondering what the story behind the stone might be. 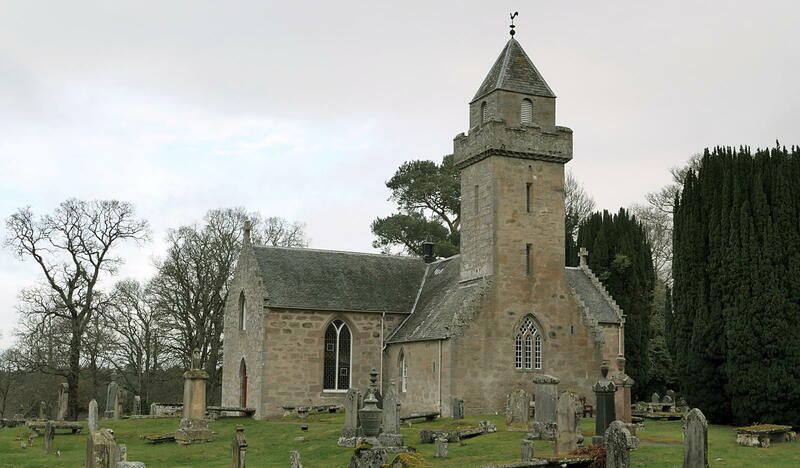 David Gray was a mason and undertaker at Poyntzfield, and he had married Helen Reid in Knockbain in 1806. A boy, John, was born to the couple in 1807, but tragically father David died just a few years later. The grieving young widow had the stone erected right by the door of the Poyntzfield mausoleum with the inscription dedicated to his memory “by his affectionate Widow Helen Reid”. And she had two entwined hearts carved on the stone. 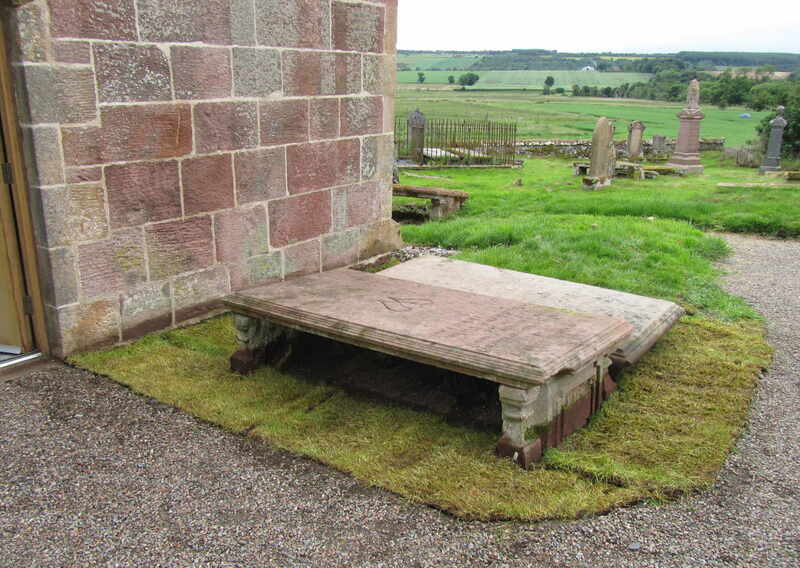 The location right beside the door to the Gun Munro mausoleum suggests that the family were well-respected by the laird’s family. The headstone to their long-serving nurse, Elizabeth Macbean, stands at the corner. The tablestone to John Johnston, the Poyntzfield grieve, lies adjacent to that of David Gray. The Gun Munro family liked to be surrounded by their faithful retainers, even in death. When David Gray married Helen Reid they were both living at Drynie, in the parish of Knockbain. Now, the Gun Munros of Poyntzfield were closely associated with the Grahams of Drynie, so it may well have been a personal commendation between the lairds that brought David Gray and Helen Reid from Drynie to Poyntzfield. The Trust has carried out little remediation on this tablestone. 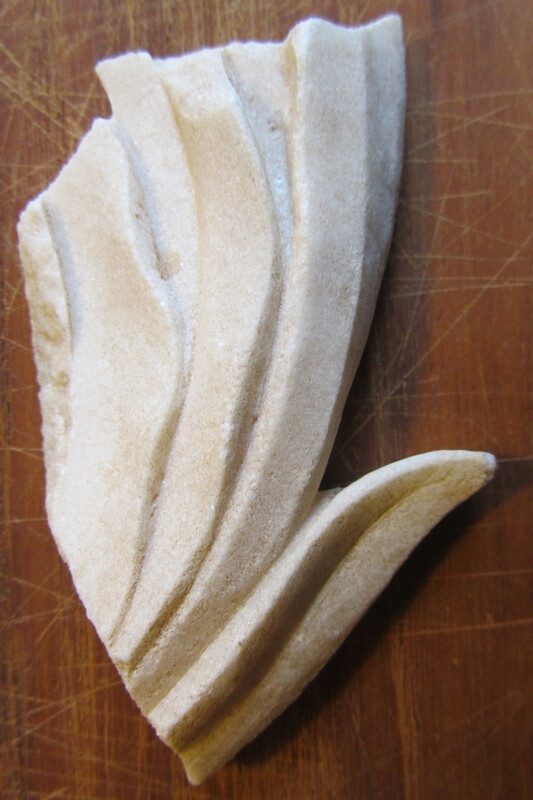 One of the legs had shed a leaf of sandstone, and we fixed that back on with resin. The gravediggers had as usual disposed of surplus soil by heaping it up under the tablestone, and even around the tablestone and by the west wall of the nave, so we took it back down closer to the original level. But other than that, it is as it was first installed back in the early 1800s. Curiously, when lowering the soil between this tablestone and the west wall of the nave we found the missing piece of marble flower bud from the Regnart monument inside the nave, and a key that we think must once have opened a lock on the gate or door to the nave. Spoil from inside the nave had been deposited just outside its doorway! Note the record of David as an undertaker as well as a mason. 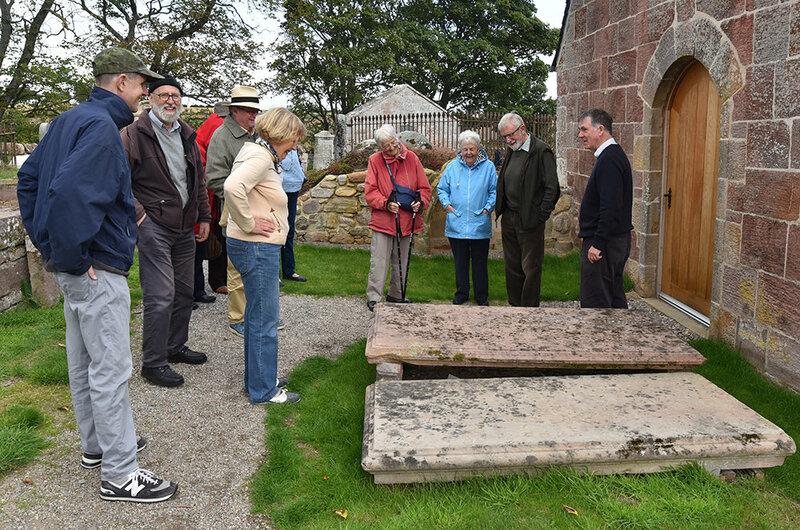 It is likely that he organised the funerals of several of those buried in Kirkmichael and may even have carved their gravestones himself. I have been unable to discover the antecedents of David Gray and Helen Reid. From the inscription, David must have been born about 1781, and Helen would probably have been born within a few years of this year as well. There are a few potential candidates in the records, but without any corroboration I shan’t even mention them. I have also been unable to discover what became of Helen after David’s untimely death. She does not appear on the Resolis poor’s roll when surviving records start in 1822. I have no record of her re-marrying. And I have not identified her from Census returns, when they started in 1841. The good news is that David and Helen’s son John not only survived but did well for himself. He was not easy to track down, and I did wonder at first if he had died as a child. However, by casting my net wider I found he had relocated to Cawdor, working as a mill-wright on the Earl of Cawdor’s estate. In 1836 he was at Brackla in Cawdor. 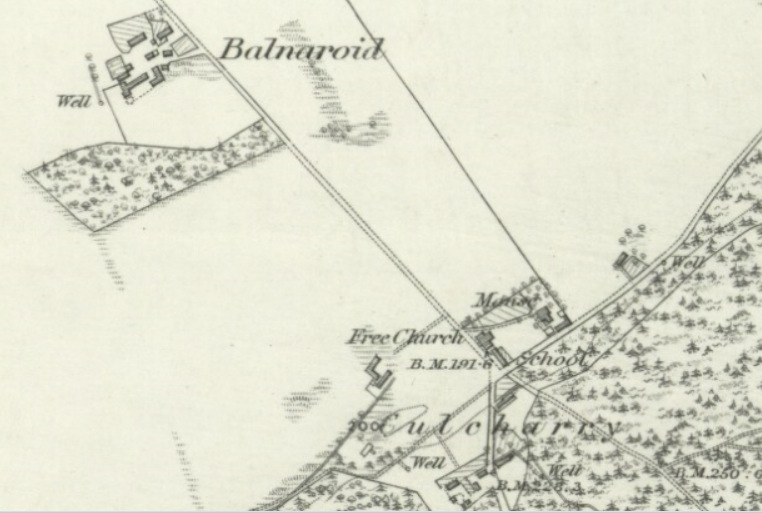 In 1841 he was at Balnarait (Balnaroid) in that parish, and thereafter at Culcharry. All three locations are so close to each other, it may be that it was just the description in the returns that changed, not his actual home. The distillery at Brackla was operating long before this time (Royal Brackla) and is nowadays undergoing a renaissance. There were many mills in the area, so there would have been plenty of opportunities for a young mill-wright. John Gray wright at Brackla & Johanna Macintyre at Culcharry were married the 25th March 1836. Witnesses Robert Fraser Brackla & Donald Macintyre Farmer at Culcharry. You will note how he was getting relatively younger as he grew older! I have not established the character of John, as he seems to have led a quiet life. There is a note in the Nairnshire Telegraph of 5 November 1853 which if anything underlines how uncontrovesial his life was if this is the highlight! Gigantic Potatoes … We have also beside us two potatoes of the early ash-leafed kidney variety, which have been handed to us by Mr John Gray, Culcharry. One of these weighs 24 and the other 29 ounces, the greatest circumference of the former being 18 inches, and its least 10, and the like measurements of the latter being 16 and 12 inches. These potatoes grew on a spot of ground which had never been cultivated until the present year. We shall at all times be happy to receive similar samples of this esculent, for (home consumpt, and) notice in our columns. 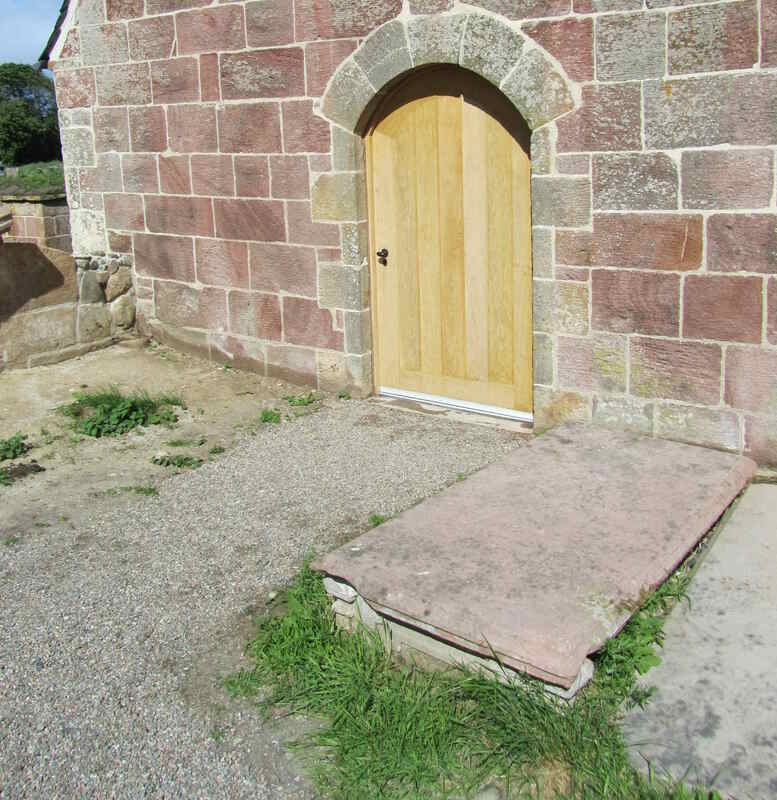 From this you will gather that John Gray was breaking in new ground at Culcharry where, according to the valuation rolls, he held a house and croft, the owner, of course, being the Earl of Cawdor. John and Joanna were blessed with children David (1837), Jane (1839), Jane (1840), James (1842), Ephibia Maxwell (1844), Patrick McIntyre Smith (Peter) (1846) and Joanna (1850). The first Jane died in infancy and Phoebe (Ephibia Maxwell) died aged only five, according to the family gravestone in Cawdor kirkyard. Of the surviving children, David became an engineer in Glasgow. At the time of his marriage in 1866, to Jane Wayman, he was an “engineers pattern maker foreman” according to his marriage certificate but “manager, Maryhill Ironworks” according to the marriage announcement in the Nairnshire Telegraph! James became a joiner in Inverness for a time, but somehow by 1879, according to his marriage certificate, had become an Iron Foundry Manager in Coatbridge! He married Maggie Munro in Inverness in 1872, and then, a widower, married Jane Cowie in Old Monkland in 1879. There were children from both marriages. I see that by 1891 he had become “Inspector of Buildings”. The youngest boy, Peter, continued to live at Culcharry, where he became a master carpenter, marrying Margaret Forbes in 1879. I have not been successful in tracking the surviving daughters. John Gray and Joanna are buried in Cawdor Kirkyard. I wonder if John ever returned to Kirkmichael to look at the tablestone erected by his mother to commemorate his father’s early passing?